Famous Hal Levitt Mid-Century Masterpiece! 2017 Modernist Tour! * MARCH 2017: PHOTOS ARE BEING UPDATED...HOUSE IS EVEN BETTER NOW! TERRAZZO FLOORS THROUGHOUT HAVE BEEN RESTORED AND POURED NEW! * One of the 8 signature homes for the 2014 Modernism tour!! * seen in many books! * Ask about hosting your wedding or special event at our home! * 4 1/2 bath (each bedroom has its own bathroom)! 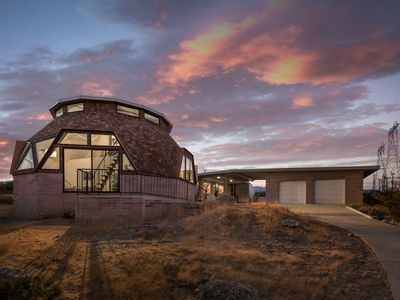 * One of a kind house! 1964, 'The Schwartz House' , designed by Hal Levitt, well known mid-century architect of the famous Trousdale Estates. Hal Levitt homes are popular among many celebrities including Jennifer Aniston. 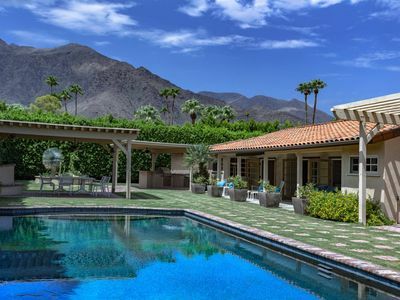 This truly one of a kind house is referred to by Palm Springs experts as 'One of the top three homes in Palm Springs'. 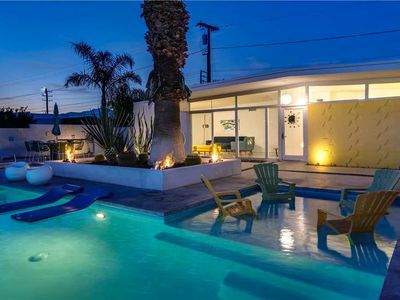 This home has been featured on the modernist tour, was in Lucky magazine, was in several 'Design Within Reach' catalogs and more. This home is truly like living in a piece of art. We know your jaw will drop and you will say 'WOW' when you enter this home! 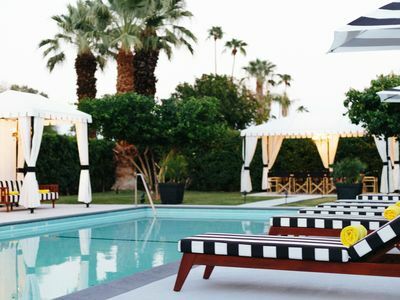 Unlike most mid-century modern homes, this quintessential Palm Springs home is almost 4,000 square feet of living space. 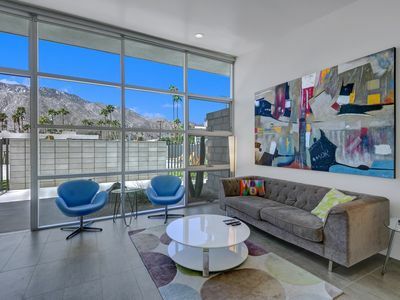 The walls of glass take advantage of the breathtaking views of the San Jacinto mountains. This open floor plan home with white terrazzo floors has two living areas... the main living room and the step down groovy lounge that provides a great place for intimate conversations, to relax, watch a movie or read a book. These two areas are 'connected' by the unbelievably beautiful see-through gas fireplace from the mid-century. All living areas have jaw dropping mountain views. 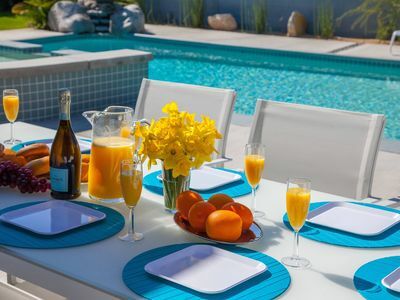 The home features a large floating dining area that seats 8 people for meals, drinks, games or just great conversation. The atrium also seats 8 people for eating under the stars or enjoying views of the palm trees. The gourmet kitchen has stainless appliances and everything you need in a kitchen including pots, pans, dishes, trays., toaster, microwave, blender, coffee pot, and much more. The island offers 4 bar stools for people to keep you company while you cook or a casual place to eat. It has four large bedrooms each with their own full bathroom, own flat screen TV, large closets, and each with access to the outside directly from the bedroom. The private outside access from each bedroom is very unique and is perfect for sitting outside for an early morning coffee or a late night drink, without disturbing the others in the house. Each bedroom has upscale, beautiful bedding...not you typical rental bedding! High thread count sheets, duvets, nice pillows, etc. If you want a private pool with stunning views, you found the perfect house. The pool and spa were just resurfaced but great care went into saving the original 1964 pool tile. .The pool area has lots of comfortable seating for lounging or sitting. It also has a beautiful sculpture/fountain, stainless steel gas grill, fruit trees, umbrella and and the world's best pool floats. It is completely private and can't be seen by any neighbors. Now...lets talk location! 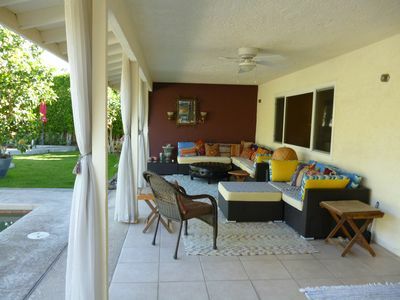 Located in the most desirable area of Palm Springs known as South Palm Springs. This home is in walking distance to the hip Ace Hotel and Swim Club and the local favorite coffee shop called Koffi. 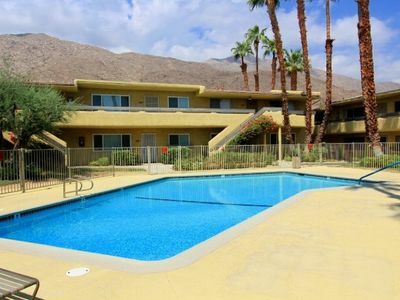 It is also very close to the main strip in Palm Springs that has lots of shops and cafes. This non-smoking home also has high speed wireless internet, amazing stereo system, a 500 CD changer, numerous CDs, board games, 2 car garage, washer/dryer and more. This home is privately owned and managed so you get first class personal attention during your entire rental process. We love our home and know you will too! Call us today to book your vacation.